Firestone Community Learning Center art teacher Julienne Hogarth laughs with students who joined her to complete the mural at our Emily Cooper Welty Expressive Therapy Center. 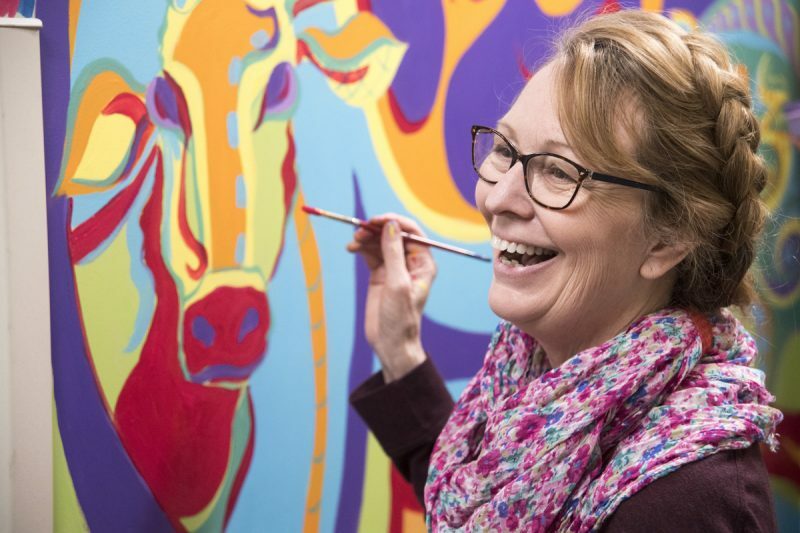 A vibrant new mural is drawing attention to the services offered at the Emily Cooper Welty Expressive Therapy Center for patients and their families. 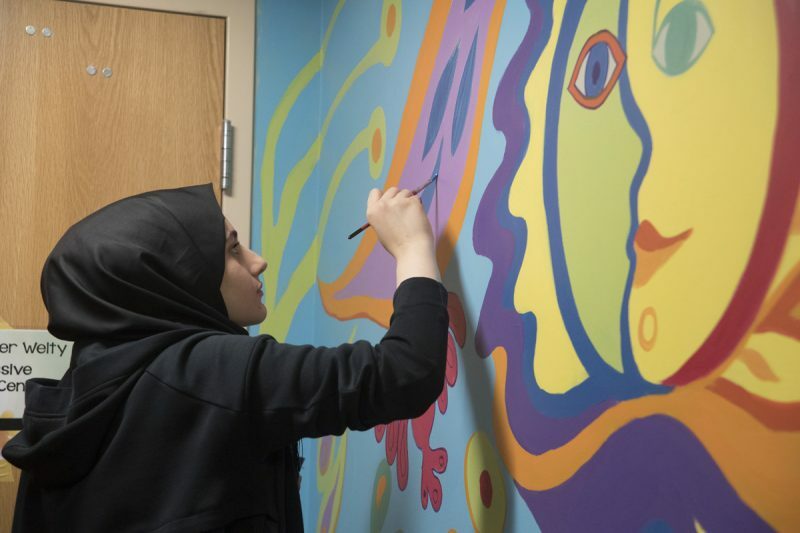 The project also gave artist Julienne Hogarth and her students from Firestone Community Learning Center the chance to give back to Akron Children’s Hospital and the center that provides holistic healing through the use of creative arts. 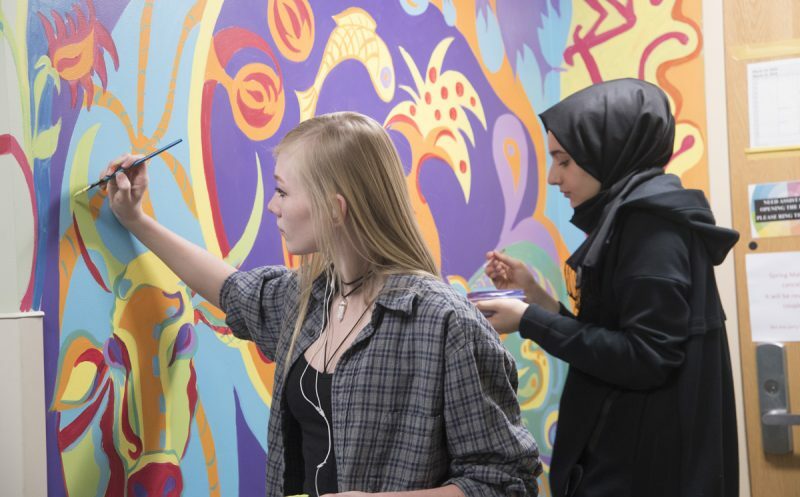 Sena Ozdemir adds details to a section of the mural. Hogarth said she learned about the center last summer while on a hospital tour because of her husband’s support of the River of Life Fund. The fund supports families coping with the extreme financial stress of caring for a child with a complex, chronic or serious medical condition and assists with urgent expenses to allow families to stay at their child’s bedside during a catastrophic illness. During the tour, the center’s staff mentioned their wish for a mural, which led Hogarth to submit her idea. She also offered to donate her artist’s fee to the River of Life Fund. 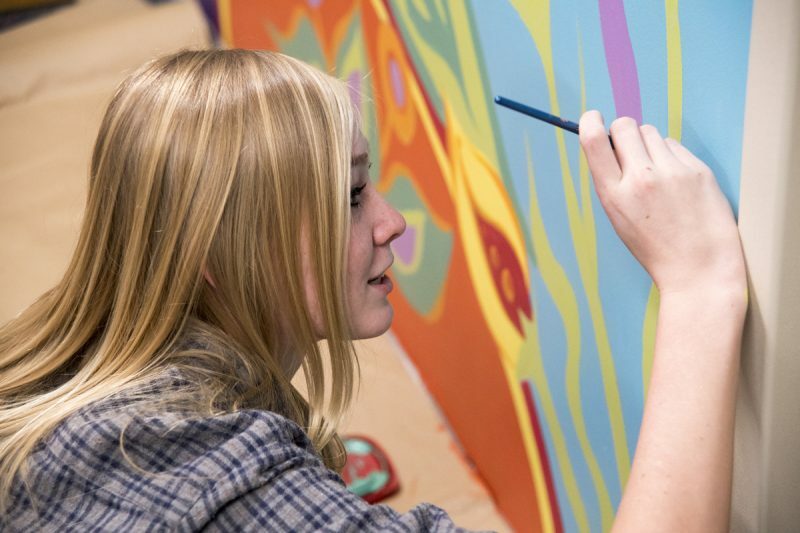 Isabelle Nutt, a junior at Firestone Community Learning Center, focuses on her work on the mural. Six students assisted Hogarth, who was influenced by Huichol yarn art from Mexico in her design. Featuring a palette of bright green, blue, purple, orange and yellow, the mural includes animals, plants, a shining sun and trees, which Hogarth said depicts how creative therapy can help an individual grow. “It’s something to inspire them,” said Hogarth, a veteran of several community art projects and a previous First Night Akron button artist. 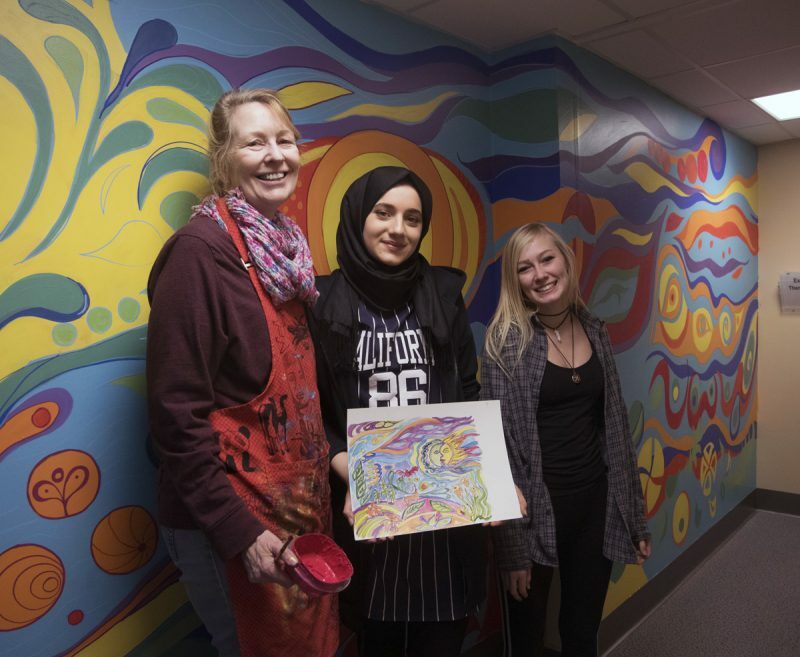 Artist Julienne Hogarth and students Sena Ozdemir and Isabelle Nutt are shown in front of the mural with one of Hogarth’s original sketches. Her students were thrilled to have the opportunity to be part of the project. Isabelle Nutt and Sena Ozdemir enjoyed painting for several hours straight while off school for a snow day.